This year, Giant Food set a goal of raising $2M and within an unprecedented six week period, surpassed that goal! Customer donations were made largely through the sale of $5 coupon books valued at $50.00. The coupon books feature Giant’s ambassadors and hospital partners, helping to put local faces and organizations to the effort. Giant Food customers brought the total amount raised to $2,076,816. 2018 marks Giant Food’s 14th year fundraising to support pediatric cancer research. Since 2005, Giant Food has raised $19.2 million for pediatric cancer research! 100% of all funds directly support The Children’s Cancer Foundation, Inc. (CCF) and the Johns Hopkins Kimmel Cancer Center. Meet some of this year’s heroes in the campaign kickoff video. Meet CCF’s 2018 Giant Food Ambassador, Cade Wineke. 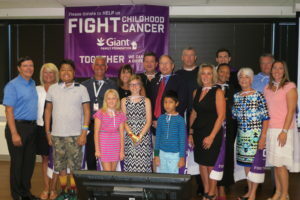 Giant Food launched its annual Pediatric Cancer Campaign fundraising program on August 17th, which will span Childhood Cancer Awareness Month (September) and conclude on October 11th. Since 2005, Giant Food has raised over $19.2 million for pediatric cancer research. Giant Food customers can purchase a $5 coupon book (valued at $50), round up their total purchase at check-out or purchase a bouquet of flowers ($.50 of the proceeds will contribute to the campaign). 100% of the proceeds raised for the Giant Food Pediatric Cancer Campaign support Johns Hopkins Kimmel Cancer Center and The Children’s Cancer Foundation, Inc. (CCF). Giant Food hosted its campaign kick-off on July 17 at Giant Headquarters in Landover, MD. Emcee Dave Johnson, of WTOP Radio and the voice of the Washington Wizards, introduced the 2018 Ambassadors and their families, and recognized Giant Food stores that led the fundraising effort in 2017. Representatives from CCF, Johns Hopkins, and Giant Food pose with Dave Johnson (center) and the 2018 Ambassadors and their families at the kickoff event. CCF Giant Food Ambassador, Cade Wineke, of Westminster, MD was unable to attend, but he proudly represents CCF in this Giant Food video. Read Cade’s story here. 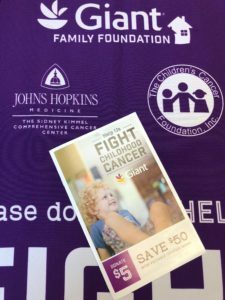 Baltimore Fox 45 morning show hosted Dr. Donald Small of Johns Hopkins and Tasha Museles of CCF to talk about Giant Food’s Pediatric Cancer Campaign on August 21st. View video here. Since 2013, Giant Food additionally supports CCF’s mission to invest in pediatric cancer research by funding a CCF Giant Food NextGen Research Award which supports area researchers that are just starting their career in pediatric oncology. This year, the Next Gen Award will be supporting Micah Maxwell, M.D., Ph.D., of Johns Hopkins Medicine. CCF is grateful to Board member Terry McGowan, Director of Food Safety and Quality Assurance at Giant Food, and to Giant Food Team for their loyal and generous support.